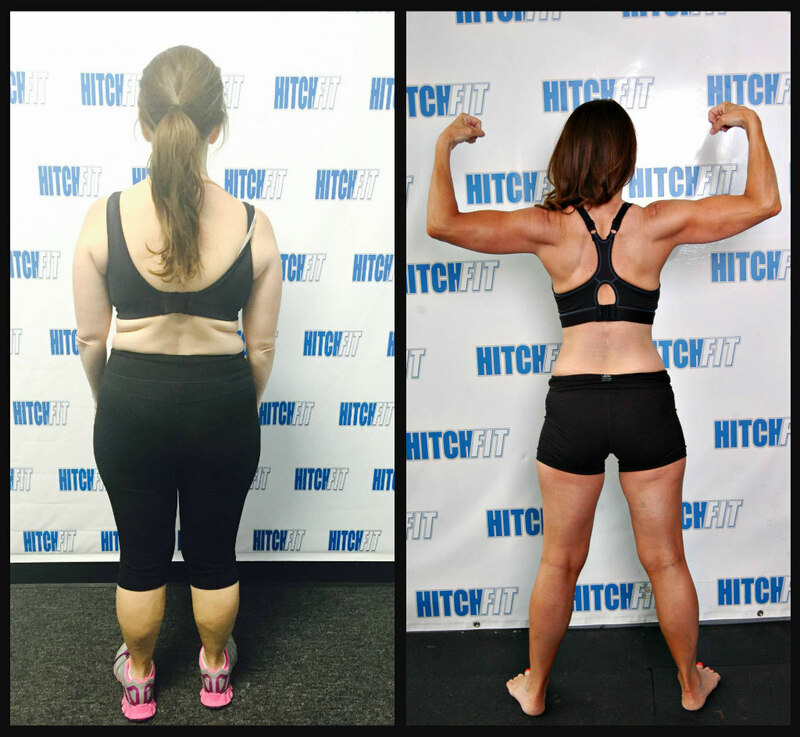 Transformation by Hitch Fit Gym Overland Park Personal Trainer (Transformer) Alma Rios! Kimberly is a mother who finally took the step to come to Hitch Fit Gym Overland Park! She shed the fat with a gluten free and dairy free eating plan and got in great shape! She lost 24 pounds and 12% body fat with Personal Trainer Alma Rios. Overland Park Personal Training Client Kimberly lost 24 pounds of fat and 12% body fat! 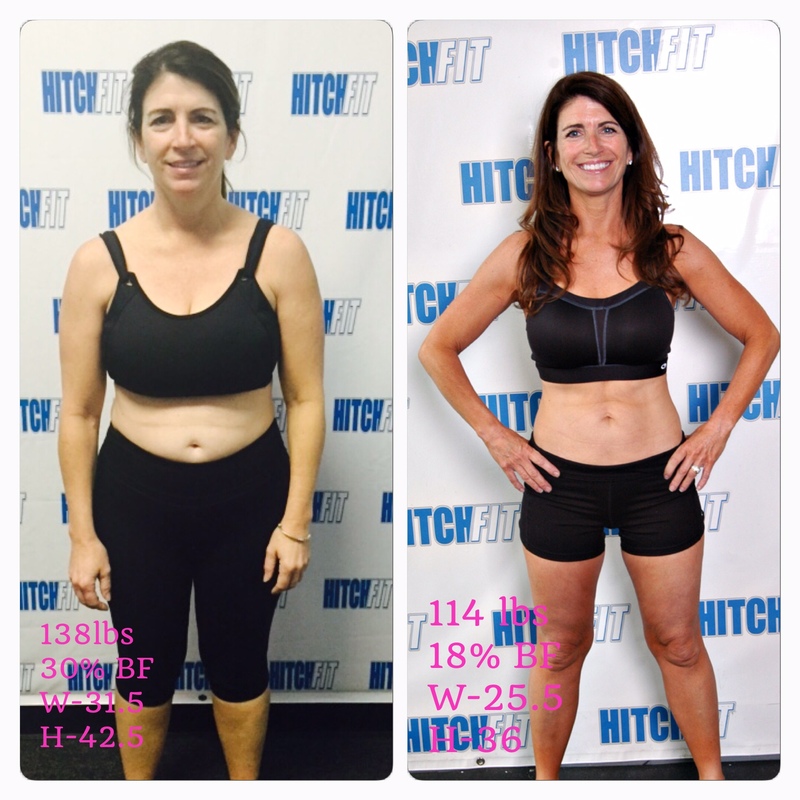 Healthy Weight Loss at Hitch Fit Gym – Kimberly lost 24 pounds & 12% body fat with a gluten and dairy free plan. “I was your typical mom, though I never thought I was! I did the eating on the run, driving thru fast food, snacking on everything, but never eating a balanced meal, eating late and being the last one in bed. I always wanted to be healthy, not just “in shape”, but healthy from the inside out. Then I stumbled onto Hitch Fit Gym, but I stalked them for two years!!!!!! I really wanted to do their program, but had many reasons why I couldn’t! Time factor being the first on my list! I am a busy mom! Working during the day, chauffeuring kids in the evening! Always on the go, literally Monday thru Sunday! When the heck would I have time?????? Then one day I saw a Groupon, I bought it. My thought was ” for such a great deal, if I don’t use it, I wouldn’t lose much money!” Then at my lowest of lows, tired, run down, and my groupon about to expire, I made an appointment. I LITERALLY dragged myself in there! On the drive there I was thinking what would be a good excuse to call and cancel! My biggest excuse was I was to flabby to go to a gym!!!! Crazy thinking right??????? I walked in, and there she stood, my Christian Grey of the workout world!!!!!! Alma Rios! She was amazing! She changed the way I ate, the way I felt about working out, the way I planned my time in my day, the way I managed my time with my family, and the way I brought my center back to me!!!!!!!!!! And that wasn’t even part of her program!!!!!!! Oh, and yes, I lost more weight then I ever had before and the inches melted off!!!! She has no idea how much she changed my life for me! For the first time in my life, I went on a vacation and STRUTTED around in my bathing suit……that’s right mom’s, STRUTTED!!!!! Best vaca ever!!!!!!! Ha ha. Are you READY for your TRANSFORMATION with Alma Rios at the Overland Park Hitch Fit Gym?